In an earlier part of my professional life, I worked as a sign language researcher and interpreter based in New York City. Well aware that the Democratic National Convention was scheduled for New York’s Madison Square Garden in August, 1980, I started attending planning meetings as a volunteer about 8 months beforehand. My reminiscences about sitting on that committee will wait for another post. Suffice it to say that when Convention week arrived, we had a sign language interpreting team ready to work on the podium and in the gallery portions of the hall, with appropriate security credentials for each area. 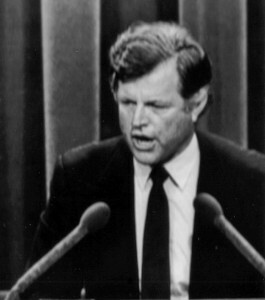 On Tuesday evening, August 12, we realized that Senator Kennedy would address the delegates. I knew this would be an important speech: He had just withdrawn his name from nomination, and he still had a strong following among a large number of delegates. Working in close proximity with Ted Kennedy meant that once I committed to interpreting his address, I was under Secret Service scrutiny, for roughly 40 minutes before we took the stage on Tuesday night until I left the stage. I recall that the pages of Kennedy’s speech were given to him in a ring binder. Each page was printed at least double-spaced in large type (probably 24 point or greater). Each page was contained in a sheet protector, making it easy to turn a single page at a time. Not only did he have the speech on the teleprompter (which is visible in the photo), but it was also at hand, in physical means, in case of a technology glitch. The television cameras were placed in several spots around the hall. This was my first experience of the “pool feed,” where all the networks relied on the same original video and audio signal, which they could edit as they wished for broadcast. When the senator was called to the stage, I followed him, ascending a narrow staircase. While it appears in the photo that I’m standing within an arm’s reach behind him, in fact I was standing more than 10 feet behind him. (The wonders of the telephoto lens.) Of course the text had been taken from me, which barely mattered because I had no place to rest a script within viewing range. The audio quality was less than ideal; I don’t recall now whether I had a monitor to listen to the sound or had to depend on the sound coming to the others on the dais. Friends and family around the country send me copies of the newspaper photo in their local papers on Wednesday. I went to UPI’s offices on 42nd Street some weeks later and got my own copy of the original photograph. The framed photo hangs on the wall at my home. I missed my chance to have Senator Kennedy autograph the image, but I’m okay with that; it wouldn’t change my memories of the experience. In recalling the events, I realize how primitive the paper credentials were, how limited the Secret Service scrutiny, and how fortunate I was to have been part of this historic occasion. Here’s a link to the audio recording of the speech (and text transcribed from the audio) , which I offer as a training exercise to all interpreting students and working interpreters. Keep in mind that as the interpreter, your goal is to convince the audience that you are delivering the speech as Ted Kennedy would have done if he had been fluent in American Sign Language (or into whatever language is your specialty). It’s a great chance to spend time with a text that has layers of meaning and historical significance, and to practice a rhetorical style which few of us get to interpret live. The challenge is equal whether you agree with his point of view or disagree, whether you admire his life and career or not. 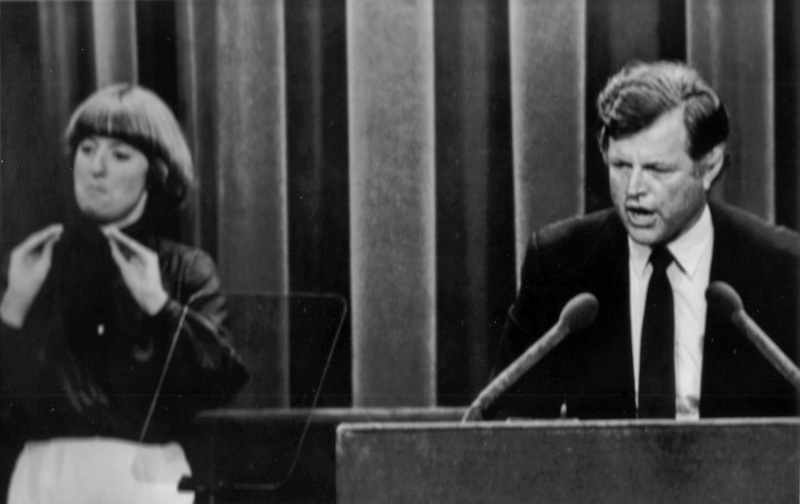 For extra credit, try it with less than 30 minutes of distracted rehearsal time, in a stadium of approximately 10,000 people who speak Kennedy’s language, where there is no obvious audience for your live translation, with an uncertain audio signal, and during live broadcast to a few million home viewers. Fishbird is powered by	WordPress 3.6 and delivered to you in 0.886 seconds using 37 queries.